When last we got a new iPod touch, the fourth-generation from 2010, it was so thin relative to other devices of that era we said it looked like "a toothpick." Its 7.2mm thinness was unparalleled -- at the time. But now, just two years later, the iPhone 5 is less than a half-millimeter thicker, and that is of course packing a lot more wizardry inside. Suddenly, that toothpick is looking a little portly, which means it's time for the touch to lose a little weight. 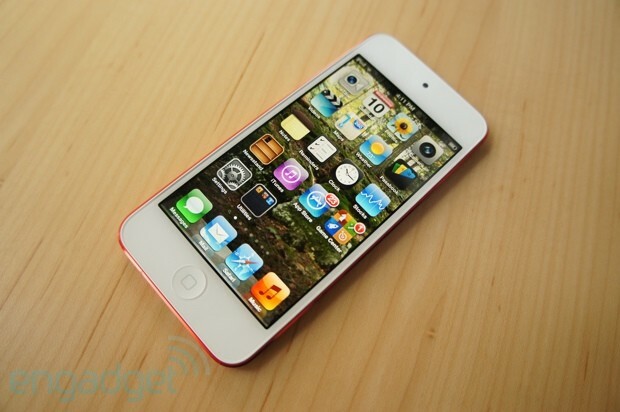 Enter the fifth-generation iPod touch, the 2012 model that has slimmed down to a mere 6.1mm in thickness. It's also about 10 percent lighter -- despite being grafted with a new 4-inch Retina display. 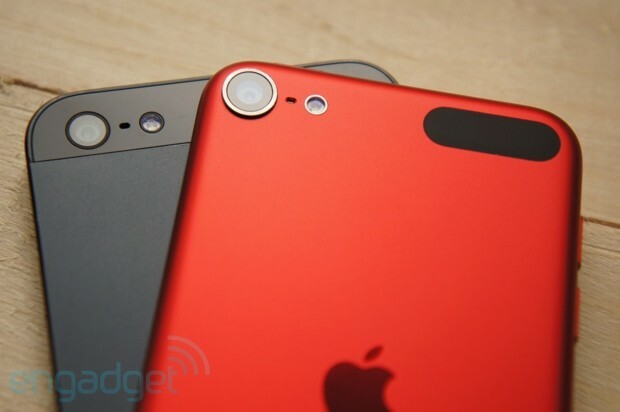 Not only is it bigger and thinner, but it's far faster and has hugely improved cameras on both the front and rear. The perfect PMP package for $299? Click on through to find out. Apple's latest iPod touch is by far its best, but it's priced far out of impulse-buy territory. 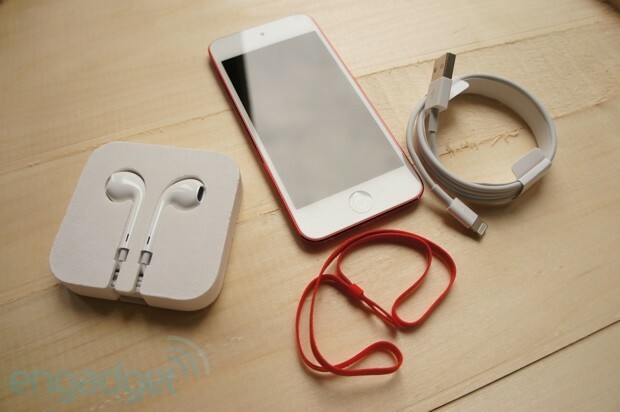 How would you rate the iPod touch 5th-gen? 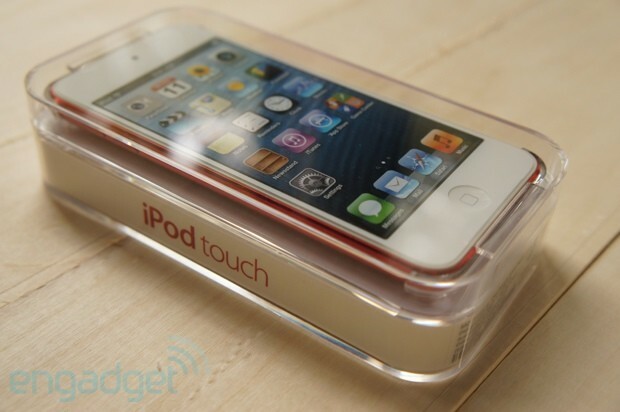 The fourth-generation iPod touch had a curved chrome back that looked absolutely lovely coming out of the box. Roughly 30 seconds later that mirrored look would evaporate, replaced by a scratched-up patina that no amount of careful handling could prevent. But, its shape felt good in the hand, with its size and weight both seeming minimal compared to nearly every other device on the market -- two ingredients for a top-notch device. The fifth generation improves on that in every regard. As mentioned above, it now measures 6.1mm thick, while its width and height clock in at 4.86 by 2.31 inches (123.4 x 58.6mm). Compared to the fourth-generation touch, which measured 111 x 58.9 x 7.2mm, the new iPod is considerably thinner, fractionally narrower and massively taller. It's also noticeably lighter, at 3.1 ounces (88 grams) compared to 3.56 ounces (101 grams) for the outgoing model. Storage capacities are now 32 or 64GB, priced at $299 and $399, respectively. We chose the special edition (Product) Red to evaluate and as soon as it came out of the box we were confident we made the right call. It's beautiful. Gone is the mirrored back, replaced by a matte aluminum shell available in your choice of six anodized colors. We chose the special edition (Product) Red to evaluate and as soon as it came out of the box we were confident we made the right call. It's beautiful. The crimson hue sets up a nice contrast to the white bezel around the glass on the front, as well as the white plastic that forms the rim of the 3.5mm headphone jack, which still lives on the bottom, but has moved to the left to match the placement on the iPhone 5. 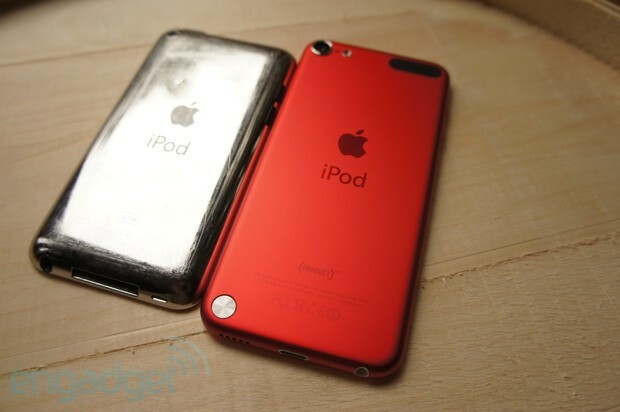 That red color bathes a machined aluminum back that has a rather more square profile than the previous iPod touch, but it's still decidedly more comfortable in the hand than the angular, industrial iPhone. The metal enclosure (which has a soft feel similar to a MacBook) is punctuated for numerous sensors, buttons and other accoutrement, with the power/lock toggle still residing in the upper-right and the volume rocker on the left side. On the bottom, next to the headphone jack, is the new Lightning connector, which is rimmed by about a millimeter's worth of raw, uncolored aluminum. Five tiny holes are drilled on the other side of the bottom, making up a puny speaker grille. On the back, the camera still peeks out of the top-left, but the module is considerably larger now and, where it was inset on the fourth-gen iPod touch, it now protrudes slightly -- just over 0.6mm, by our measurements. This means the overall actual thickness of the device is closer to 6.8mm, a difference that only those wearing the tightest of skinny jeans need concern themselves with. The camera portal is considerably wider in diameter, too, still flanked by a small microphone opening but now joined by a third opening: an LED flash. It's a 5-megapixel sensor this time with the same basic array of lenses and mechanics found in the iPhone 4S. 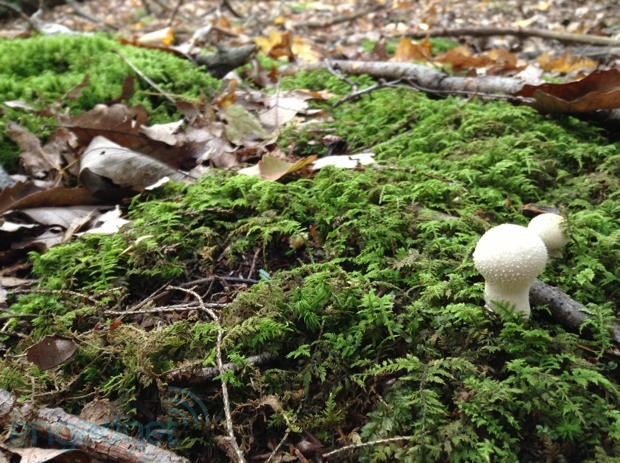 Geotagging photos is more popular than ever. Sadly, the iPod touch is left out of that party yet again. Keep moving across the top back and you'll find a small black plastic patch, similar in feel to the plastic section on the top of the iPad. It's here that the iPod's dual-band 802.11a/b/g/n module sends and receives its data. There's Bluetooth 4.0 support in here too, as well as Nike+ connectivity, but sadly still no GPS. The ability to properly track your movement using fitness apps like Strava would make this an even more compelling workout companion, and of course geotagging photos is more popular than ever. Sadly, the iPod touch is left out of that party yet again. The most curious bit of connectivity is found at the bottom of the device. It's a little brushed metal circle that, when pushed, pops out slightly. 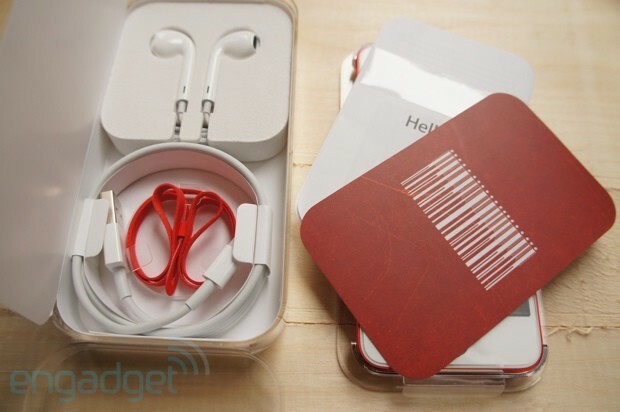 It's here that you attach the curious little microfiber wrist strap that Apple includes with the device. But, in typical Apple style, it isn't called a wrist strap. It's "the loop" and it's designed to further ramp up this thing's street cred as a compact camera. Finally, on the front things are more or less as they were before -- just taller. Up top, there's a 1.2-megapixel FaceTime HD camera peeking out of the bezel. Down below, there's the same subtly recessed home button we've come to expect. In between? Here lies something special. The vertical growth of the iPod touch is for one reason and one reason only: to accommodate the new 4-inch display that debuted in the iPhone 5. Yes, this is the exact same panel as the iPhone, not a cut-rate version like the last iPod touch received. That means a 326dpi, 1,136 x 640 IPS LCD screen. This is among the best panels on any mobile device. We gushed about this panel in the recent iPhone 5 review, so we won't spend too much time covering such well-trod ground, but we will reiterate our thoughts from before: this is among the best panels on any mobile device. Brightness and contrast are top-notch and viewing angles are wide enough to ensure that you can enjoy everything from all sides. However, we would point out the lack of a brightness sensor here, so unlike the iPhone (and, indeed, the last iPod touch) this thing won't use an appropriate brightness for all lighting conditions -- at least, not without a little help from you. The fifth-generation iPod touch sports a dual-core A5 processor and, while Apple isn't quoting specs, thanks to benchmarking apps we know it's running at 800MHz and is paired with dual-core PowerVR graphics. So, just like the iPhone 4S that came before. And our benchmark results back that up. An average Geekbench score of 627 is right where the 4S tends to rank in, and an average SunSpider score of 1,785 is even better. Our impressions upon using the device definitely match up with those numbers. The iPhone 5 leaves the new iPod in the dust in all regards, but it's a massive leap beyond the old iPod. We've not been able to run the device through a full battery test, but Apple rates the new iPod touch as having the same music listening time as the previous generation (40 hours) and rates its video playback for an hour longer -- eight versus seven. We've never had a complaint with the longevity of the fourth-gen iPod, so we expect this new model to live up to expectations. While the new display is the most noticeable departure from the previous-generation iPod and the new silicon on the inside certainly makes for a markedly improved experience, it's the pair of new shooters that mark the biggest step forward from the previous touch. The 1.2-megapixel FaceTime HD camera up front appears to be the same as we've seen in other devices, meaning it's quite good even in conditions with middling light. Photos are light-years beyond those captured by the previous touch, meaning this does indeed do a reasonably good job as a compact camera. It's the 5-megapixel setup on the back that's the star of the show. No, it isn't as nice as the new 8-megapixel module on the iPhone 5, but the new iPod does match the performance of the iPhone 4S in most regards, which is to say it takes some great stills. Photos are light-years beyond those captured by the previous touch, meaning this does indeed do a reasonably good job as a compact camera. They don't live up to the photos on the 5, and indeed in lower light you'll see a good amount of noise, so serious photogs will still want to lug along something with a bit more horsepower. But, for more casual holiday snaps, the touch does a respectable job. It also captures compelling video at 1080p, though the video stabilization here doesn't seem nearly as good as that on the iPhone 5. Trying to walk while filming, a situation handled commendably by the 5, creates a jittery mess here. You'll want to practice those deep-breathing and soft-walking techniques you learned in sniper school. Additionally, you're unable to take stills while recording video, as you can on the iPhone, but overall video quality is more than acceptable. Well, it's iOS 6, so you should know more or less what to expect here. Siri is now here, so you can get yourself some spoken-word advice from your slender PMP, and all the iCloud, Safari and other upgrades that were grafted onto the latest version of Apple's mobile OS have all come along for the ride. There's also the new Maps, for better or for worse, but without GPS you'll be a little bit restricted in terms of what you can do with it. You can also load up third-party navigation apps like TomTom or CoPilot Live, but again they won't be much use anyway. We stacked the new iPod touch up against a number of comparable offerings, including the fourth-generation touch, the new iPhone 5 and the new nano as well. We also lined up three sets of headphones, starting with Apple's own EarPods, which we put through the paces and found to be perfectly adequate. We also went a little higher-end with a set of Klipsch S4i buds and, finally, some Sennheiser HD555 cans. The new touch performed well with all, not noticeably better or worse than its predecessor. The internal speaker, meanwhile, is predictably weak, again performing about as well (or, rather, as poorly) as that on the previous touch. You can hear it, but you certainly won't want to use it for much. 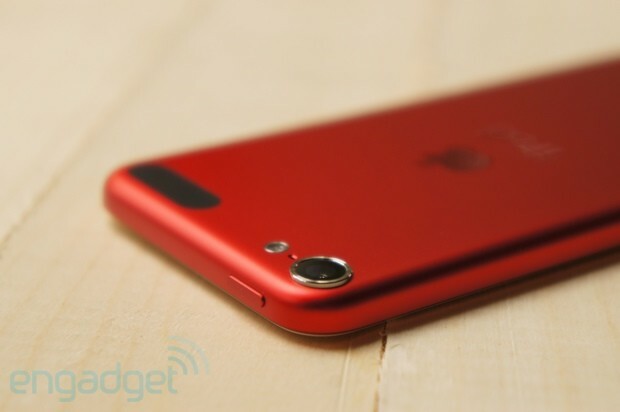 As an upgrade, the fifth-generation iPod touch hits all the right marks. It's thinner and lighter despite packing a bigger and (far) better screen. It's faster despite having better battery life, its pair of cameras are markedly better than those found in the previous touch and its new matte aluminum exterior certainly seems like it will prove rather more durable in the long-run -- though time shall tell on that front. That the new touch is rocking Apple's new Lightning connector will be a drawback for those with legacy docks and the like, but this is clearly the path the company is taking going forward, and there's not a lot of sugar we can put on that pill. The iPod touch is a comprehensively better package than the previous-gen unit but, at $299 to start, it certainly doesn't come cheap. If you're reasonably content with your fourth-gen this is probably not worth the upgrade, but if you have an older iPod that's ready for retirement, or are indeed just jumping on the iOS bandwagon for the first time and are happy with your current phone, this is a great place to start.